March « 2012 « Welcome to Property Source Nation! New FHA Rule to ‘Kick Some Buyers Out’? As Alex reported 3/31/2012 on Property Source Radio. The Federal Housing Administration announced that starting April 1 it will not insure mortgages to borrowers who have an ongoing credit dispute of $1,000 or more on their file. To be considered for an FHA-backed loan, borrowers will either have to pay the remaining balance on the credit dispute or enter into a payment plan, making at least three payments on it. Any payment plans will need to be documented and submitted to FHA, which will then figure it into the debt-to-income ratio for the new mortgage. FHA’s new rule does not include disputed credit accounts from more than two years ago or any related to reported identity theft. Still, the new rule has some in the housing industry worried that it’s going to keep more potential home buyers from securing a mortgage. “We expect this revision will certainly kick some buyers out of the marketplace, and we’re in ongoing efforts to quantify how extreme the impact will be,” Lisa Jackson, senior vice president of research at John Burns Real Estate Consulting, told HousingWire. Jeremy Radack, a real estate attorney in Houston who assists with financing, estimated FHA originations may be reduced by 33 percent to 50 percent this year due to the new rule. FHA says the rule is aimed at protecting the FHA’s emergency fund, which has fallen below the mandated amount Congress requires. Also in reimbursing the emergency fund*, FHA announced it would raise its insurance premiums starting April 1 too. As Alex reported 3/24/2012 on Property Source Radio. Economists say the housing market is starting to heal, but too many people aren’t aware of it because they’re judging a housing recovery on the wrong sign: What’s happening with home prices. Paul Dales at Capital Economics says higher prices won’t be the sign that the housing market is on the mend — that can be a lagging indicator — but rather an increase in overall home sales. And that’s showing signs of improvement: Existing home sales in 2011 rose to 4.26 million compared to 4.19 million in 2010. In the last six months alone, home sales have increased 13 percent. Join House and coyne this Saturday from 9-10am on Property Source Radio as they have a full show with 4 guests in the hot seat! Marc Wasserman of Rochester Window Cleaning, a veteran of the show, demonstrates their new gutter glove protection system – Now available here in Rochester! “By far, the best product on the market for keeping your gutters clean all year long!” Visit GutterGlove.com to see more. Mention Property Source Radio and receive 10% off! Call 235-1200 for more information. As you can see from the photo of the product, a MAC truck can’t get through this thing – No more cleaning your gutters! Attaches under your shingle and flashing. As Rain water comes down from the roof it filters through the mesh and into the gutter. Leaves and debris from trees sit on top and blow off the mesh! Click image to see a closer look! Flower City Glass shows us the new products they have for shower glass doors. To see the different brands and styles, visit flowercityglass.com. For a consultation, call them at (585) 546-8646 or visit their showroom @ 188 Mt. Hope Avenue, Rochester, NY 14620. As Alex reported 3/17/2012 on Property Source Radio. The spring selling season is already heating up for home builders, with sales activity increasing and some builders slightly increasing home prices, reports Barclays Capital. “We believe the spring selling season has arrived strongly enough to kick-start a positive feedback loop in housing for the first time since 2005,” Barclays Capital analysts reported. Analysts with Barclays Capital project 1 million housing starts by 2013. The analysts project that housing starts will return to 1.7 million — a more normal amount by historical standards for the sector — by 2015. Last year marked one of the worst selling years for home builders on record. Some home builders have already started rising prices slightly by about $1,000 to $3,000 due to the increase in demand. Analysts attribute some of the pick up in demand to the rise in the nation’s employment rate recently. “Job creation has been considerably better this fall than it was last year, which we believe will lead to a stronger, more sustained spring selling season,” analysts say. We have had numerous instances where clients and/or realtors have asked us whether a house that we are inspecting conforms with codes. Home buyers sometimes confuse our inspections with code compliance inspections. Pre-purchase engineering inspections of houses or buildings are not code compliance inspections. Such an inspection is considered to be well beyond the scope of a building inspection as defined by the professional standards that govern home inspections. By law, the local building department inspector (Code Enforcement Officer) has almost the final say in interpreting and applying codes. Although we can sometimes comment on the applicable codes, the final determination must be the local CEO. Modern electrical codes dictate that electrical outlets in “potentially wet locations” be protected by ground fault interrupter protection. These locations would include some kitchen outlets, bath outlets, exterior outlets, pool equipment, etc. 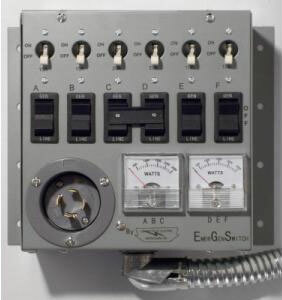 However, if a house was built in the 1950s it may not have ground fault protection for a bathroom outlet. There is no requirement that ground fault protection be installed. If this same bathroom were to be renovated the electrician who is performing the work would be obligated to install ground fault protection at the time of renovation. Today’s codes apply to the new work that is currently being performed. Another example would be entry doors that separate a house from an attached garage. Modern codes for new work dictate that the door leading from the house to the garage must be a fire-rated door (usually metal) with a metal jamb. Also, a self-closing hinge is required for the door. This would prevent the door from being left open. The purpose of this code is to help prevent a fire from easily spreading from the garage to the interior of the house. If an existing house built in the 1940s has an attached garage, and the door leading to the garage is not a fire-rated door the homeowner is not be required to replace the door. However, if they chose to replace the door, their obligation would be to utilize a door that conforms to current codes. A third example would be that of automatic garage door openers. For a number of years new automatic garage door openers have been required to have redundant safety reverse features. This means that the door will reverse if it meets an obstruction or hits an object during the downward motion. Also, new openers must have an electronic eye safety reverse. This makes the door reverse if the electric eye (or safety beam) is crossed when the door is in the downward motion. Of course, there are many old openers still in use that would not conform to these standards. There is not a requirement that these openers be replaced. The requirement would apply to openers that are currently manufactured and installed. Homeowners should also understand that overzealous contractors will tend to overstate the necessity for proposed repairs or modifications based on code requirements. Once again, homeowners should understand that in many cases work does not need to be performed strictly because an existing component does not conform to modern codes. However, it is also important to understand that codes have mostly been established in the interest of safety. As a result, homeowners should consider modifications as an improvement and for the benefit of increased safety in their home and to the occupants. On a related topic we have also seen an increased concern for finished basement space. Fire and safety codes that have been in place for decades dictate that basement space cannot be considered living space without a second means of egress. Since the mid 1980’s, finished rooms in a basement are only permitted if there are two exit points. The stairs leading into the basement would be one exit point. The second egress is usually an appropriately sized window or a door. There are also definite requirements that dictate whether a window would be an acceptable means of emergency egress. The window must be a certain minimum size (width, depth and square footage of opening), and the bottom of the window cannot be more than 44 inches from the basement floor. A basement level bedroom must be equipped with its own means of egress. In other words, if a house has a finished basement that includes two bedrooms there must be an egress window or door from each of the bedrooms. We hope that this brief explanation provides some clarity to the questions surrounding code issues and finished basement spaces. Please do not hesitate to contact our office or any of our engineers if you have any questions in this regard. Many areas of the country have basements with sump pumps. 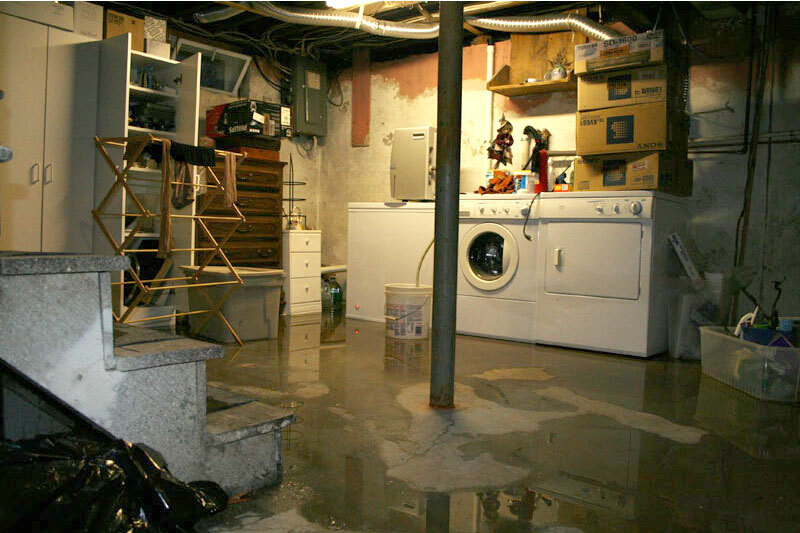 Most basements that are not built near a deeply buried storm sewer will have a sump pump. With the somewhat porous masonry block basements that are commonplace in our region, along with the floating slab floor drainage systems, a reliable means of pumping water out of the sump is important to protect the basement and all of the items and equipment contained therein. Every few years, our region will be the unlucky recipient of an ice storm. When this occurs, the power can be interrupted to thousands of homes throughout the area. These interruptions can last anywhere from a few minutes to a few weeks. Couple this with other “normal” interruptions of electrical power and there is a significant potential for your primary electric sump pump to be out of commission. There are several means of providing a backup sump pump, or at least a backup means of pumping water out of the basement in the event of a power failure. Battery backup pumps, water-powered pumps, portable emergency generator connections and whole-house gas fired generators are all potential solutions. These methods provide varying degrees of reliability, endurance, and additional benefits. 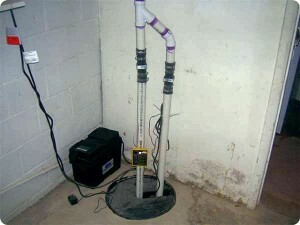 Perhaps the most economical method of providing a backup sump pump is a battery backup sump pump. There are many of these available and they vary in size and capacity. Costs vary, but are typically in the range of $200 to $400 for the pump and accessories, plus $75 to $300 for the battery. If installing this on your own, the cost would be $300 to $700. If hiring a handyman or plumber, you might spend $600 to $1,000. Basically, these backup pumps consist of a second, individual pump that sits in the sump alongside of the primary electric pump. The float or actuator for the pump will typically be set several inches above the main pump. That way, if the water level rises above the level that the main pump can typically maintain, the backup pump will automatically turn on. Usually a buzzer or alarm will sound to let occupants know that the battery backup pump is in use, and that the main pump could need servicing. In the event of a power failure, servicing the main pump would be of little value, other than running an extension cord form the main pump to a portable generator. Once the battery backup pump is operating, there is a limited run-time for the pump. Typically, this varies from between 6 to 12 hours of run-time. 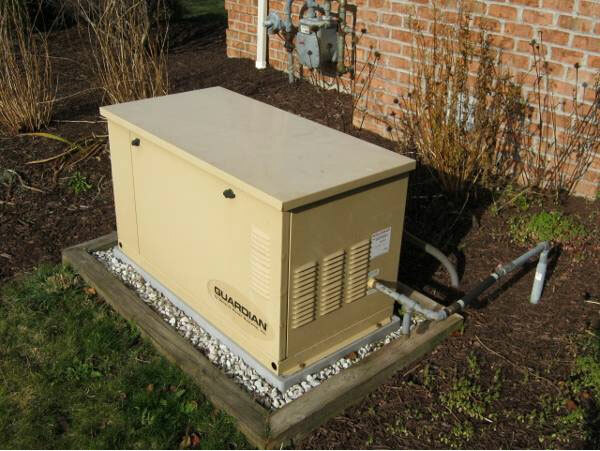 During an extended power failure, this may not provide enough time to fully protect the basement, but it does provide a time “cushion” during which a generator or alternative pumping means could be set up. It also is adequate for power failures lasting for only a few hours. A step above the battery-powered pump is the water-powered backup sump pump. These are popular due to their relatively low first cost, along with the fact that they will run indefinitely, as long as there is a pressurized source of municipal water to the house. Obviously, this is not a good solution for homes with a water well. 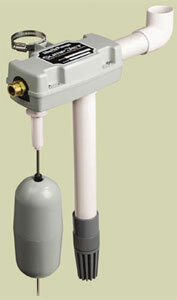 Although there are different models, the most widely used water-powered pumps only cost $120 to $300. However, there is some water piping necessary, in addition to drain piping. Further, the local water authority requires a type of backflow preventer on the water supply piping to the pump. This may actually cost as much as the pump. Together, the cost could range from $250 to $450 self-installed or $450 to $700 installed by a contractor. There is no alarm to let occupants know that the water powered pump has activated, pump these are typically loud enough for you to hear them engage and disengage. These pumps should be checked periodically for any leaks in the piping and valves and a type of flow alarm on the piping is a good accessory to consider to let you or your security provider know when the pump is in use (or if the water line for the pump broke and is flowing). Of course, water-powered pumps will run as long as the water pressure from the municipal service is adequate (usually 30 psi is required). These pumps also use a lot of water that you will be billed for when the pump is needed. If the power to the house is interrupted, the best solution is to have a backup source of power. One method is to use portable gasoline powered generators. There are many, many models of generators available with a huge variation in price based on brand, capacity, features, and more. 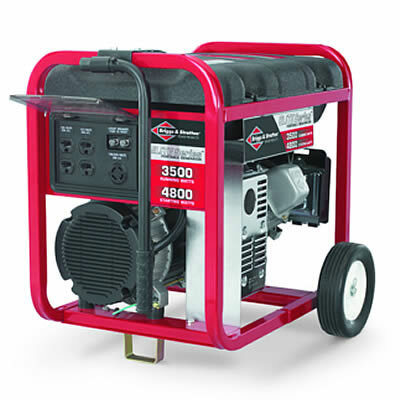 Prices for the generator can range from $100 to $5,000. There are small generators that can simply be operated outdoors near the basement with an extension cord running to the sump pump. However, for greater reliability, and to power other appliances such as the furnace and the refrigerator, a larger portable generator and a manual transfer switch are a better choice. This allows safe connection and operation of the outdoor generator and eliminates the risk of back-feeding the utility company service. 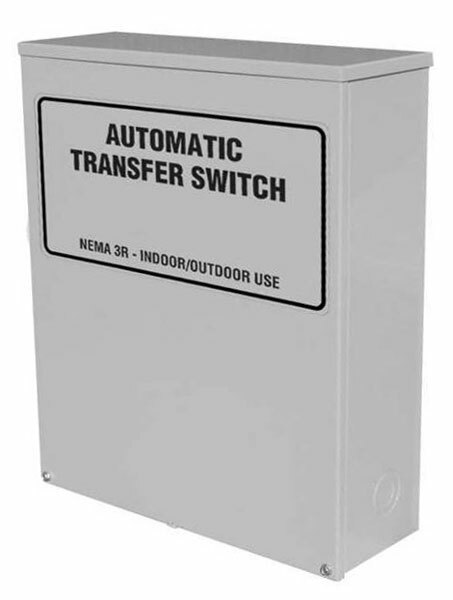 The transfer switch has fuse or circuit breaker protection for the specific circuits as well. 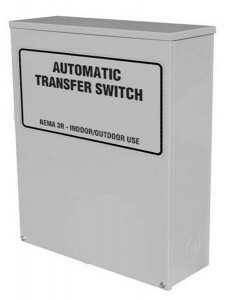 Transfer switches can cost from $250 to $400, plus installation by a qualified electrician. There are high water level alarms available for sumps that are battery powered or connected to the security system of the home. These are helpful to alert you when the pump fails and when you need to get the generator connected and working. As long as you can keep the generator running and working, you can run the sump pump. In homes where constant pump operation is a possibility, having a second primary pump available in the event of a pump failure is a good idea as well. The Taj Mahal of backup pumping provisions is the whole house generator. Permanently installed natural gas powered generators provide the most reliable backup sump pump option. Along with an automatic transfer switch, a whole house generator can automatically supply power to most, if not all, of the house, including the sump pump. High quality comes at a high cost, and the installation of a whole house generator can run from $4,000 to $15,000. As with any mechanical equipment, generators require maintenance. The whole house generator will typically run once per week for several minutes to “exercise” the unit and help charge the internal electric start battery. Similar to a car, there are air filters, oil filters, oil changes, etc. If you are not familiar with changing the oil in your car, you will want to consider a service contract to maintain the generator to make sure it is always ready for operation. Whether or not a backup means of pumping water out of the basement is needed depends on many factors. Some basements have gravity drains and do not require pumps. 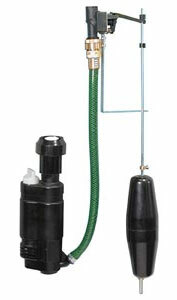 Some sump pumps never run because the sump never accumulates water. But for basements with pump that run frequently during the spring and after rain storms, a backup means of pumping is good insurance. We hope that the information above clearly points out some of the options and costs for backup sump pumping. As always, we welcome any questions and comments that you may have regarding this topic or other relating to building inspection. When To Pay The Contractor and How Much? You’re planning a home improvement and hopefully got three estimates from contractors that you checked out with the Better Contractors Bureau. You have decided on one as your contractor and call him to let him know he has the job and set a date for him to come over to sign the contract and discuss the specifications, approximate start and completion dates and most important to him the payment schedule. You check the contract over to make sure it contains the contractor’s company name, address (not P.O. Box number), phone number, correct price, specifications, and the payment schedule. You find that he’s asking for a large down payment and three progress draw payments that are tied to various phases of the project’s progression phases. This is where you have the upper hand and hold all the so-called cards! (money) Never give a large down payment! It’s suggested that you give a good faith deposit of no more than $500. Where specialty items have to be ordered such as custom cabinetry, custom windows or doors or any other items that will only be able to be installed in your home he will usually ask for more but it’s advisable to tell the contractor when he produces proof of the actual placed order you will then give him a draw for the item. The regular payment schedule in the area is usually a small good faith down payment and then three progress draws. Always make sure the payment coincides with the work that’s done. For example in the case of an addition if the contract states one third when the mason starts the foundation don’t pay it until you see the materials are on the site and the mason is actually working. The same for a framing draw or other similar work done. Any remodeling contractor worth his salt should have enough credit to buy materials and pay subcontractors to get the work started. However some suppliers want payment up front on specialty items and won’t except credit so in this case the contractor is within his right to ask for payment before ordering. Most jobs will entail changes so be sure that you get the specifications and cost in writing and signed by both parties! Again don’t pay for a change upfront and only when the change is started. No matter what the draw schedule is that you agree on always protect yourself and keep a large enough balance to insure that the job is to your satisfaction. A walk through final inspection should be mandatory and usually produces a punch list. If the job is completed and the punch list only has a few minor items on it such as some missing caulking or a molding that needs replacing and the balance is large then you should work out a payment for the balance holding enough to insure the contractor returns to finish the punch list items. Do not add to the punch list after the initial one so be sure you have listed all your concerns. When the job is finished hopefully it was an enjoyable experience and you can recommend the contractor to friends and relatives. Good Luck with your project. “As soon as the economy and housing market improve, mortgage rates will go up.” That is a sensible and common belief among economists and experts in finance. “Mortgage interest rates won’t go up until 2014.” That is what the government economists are saying. Well, you, the real Buyers looking for houses are smarter than that. You know that rates under 4% are tremendous. I know you know that because you are coming into the market in huge numbers in nearly every market across the United States. They Are Reaching in Your Pocket Over and Over. It is possible that specifically the interest rates on mortgage loans will stay low for quite a while but Federal fees on those loans have just gone up and that trend is likely to continue. Instead of the banks making the additional income on higher interest rates the government is collecting that income with increased taxes, mortgage insurance and fees. Either way, the result will be that the cost of buying a home with a mortgage is likely to increase steadily. So, this spring market is unique moment; when interest rates are low. Prices are soft at the same time. And fees are as low as they will be for quite a while. Real Estate prices are driven by supply and demand. In some markets around the country there will be an influx of foreclosure homes that will depress prices further. For Buyers this is an opportunity not a problem. Sellers in those areas will be wise to put their house on the market sooner than later. The problem for Buyers will occur at the peak of the spring market. In most markets around the country, there will be a few weeks or a month this spring when the greatest flurry of Buyers will be buying. For that period demand will exceed supply. You will know it is happening when every house you look at sells quickly and most have multiple offers on them. During that period prices will peak and Buyers will be forced to pay a premium. Most years those higher prices sustain and values rise. It is likely that this year, like the last two years, prices will slide back to pre-peak levels by summer. So, Buyers would be wise to buy sooner than later as well. My Clients took advantage of the foreclosure bust by developing relationships with banks nearly a year before it became obvious that there was a serious problem. The Agents I coach informed their Clients, the Buyers and Sellers in their markets of trends that make them or save them money. Rich Levin is a National Real Estate Expert who has coached hundreds of Agents and Brokers to extraordinary success. His insights and talent are proven over the last two decades. Rich conducts a 15 minute coaching webinar every week day morning so you can see and hear him in action. Register at www.FreeCoachingWebinars.com. You can contact him at 585-244-2700 or Rich@RichLevin.com. This week’s show is jam packed with guests and information. Our second segment features Tom Pelusio from family-owned Rochester Linoleum and Carpet One, now with its newest location in Canandaigua. Visit their website at http://www.rochesterlinoleumncarpetone.com/ and check out what’s on sale this week. Then of course our weekly segment, “Carlos In Your Corner”, followed by Ted Wood who’s in talking about City Living Sundays. Join us this Saturday at 9:00 a.m. in 950 ESPN radio. Coast to Coast the Market is Heating Up. Jan is in Los Angeles. Donna is in Long Island. Both are selling million and multi-million dollar homes. Kelli is in Florida. Kyle is in Illinois. Both are selling one hundred thousand dollar homes. From coast to coast, border to border Real Estate markets are already busy. All signs indicate that people are realizing that home prices are down, interest rates are down and what is called the house affordability index is the lowest it has been in a century. WIIFM… So, What’s in It for Me? If you don’t own a home and you are able to buy, that is, if you have a secure job, a modest amount of cash, and decent credit then you can borrow more money and buy more home than people have been able to buy for over a hundred years. It’s crazy but it’s true. You will have a huge tax deduction each year. When you own a home no one raises your rent or limits the use of the space in which you reside. There is more in it for you but this is enough for now. If you are selling, with the activity in the market this spring, this will inevitably be another time when Buyers are competing for the best homes for sale. Much like what happened during the tax credit flurry. There will be a bump in prices. Follow your REALTORS® advice about the ways to make your house look its best. If it doesn’t sell quickly, adjust the price every three or four weeks and don’t be too concerned over taking a slightly disappointing price if you able to get a great price on the home you are buying. And if you are an Agent, get on the phone and call all of those people who said they were waiting for the market to get active. It’s active. Follow up on all the leads that come your way. Hold Open Houses, and talk to the Guests who attend. The market is full of people eager to finally make the move they have been thinking about. Real Estate Buyers and Sellers will only wait so long. Families grow. Jobs are gotten People get new jobs or lose them and lost. People divorce and die (unfortunately). There are a myriad of reasons that people move. When those reasons arise people will wait for a while, even a year or two, then it’s time to get going. When the reason people delay is widespread, like concerns over the economy, then lots of people delay and at some point they are willing to take the risk. At that point, many people enter the market at once. We are experiencing one of those times. Politically, if you like our president then you may believe he has figured out how to make things better. If you don’t like our president, then you may be optimistic that his replacement will make things better. Either way, lots of people for lots of reasons are choosing to buy that home or make that move that they have been delaying. Trust the smartest most successful people you can find. Billionaire Warren Buffet’s secretary of 37 years, Debbie Bosanek, asked him if he thought it was a good time to buy. She said, “He told me that it will be the best opportunity in my lifetime.” Nearly all of the economists, successful investors and financial advisors, even the ones that, just last year, were saying it was not yet the time to buy a home are saying that now is an opportunity that is extraordinary. There is widespread, nearly universal belief that we have hit the bottom of the market. Rich Levin is a National Real Estate Expert who has coached hundreds of Agents and Brokers to extraordinary success. His insights and talent are proven over the last two decades. Rich conducts a 15 minute webinar every week day morning so you can see and hear him in action. Register at www.FreeCoachingWebinars.com. You can contact him at 585-244-2700 or Rich@RichLevin.com.